This article describes how to control your costs in Log Analytics by setting the data retention period. Refer to the following articles for related information. Analyze data usage in Log Analytics describes how to analyze and alert on your data usage. Monitoring usage and estimated costs describes how to view usage and estimated costs across multiple Azure monitoring features for different pricing models. It also describes how to change your pricing model. 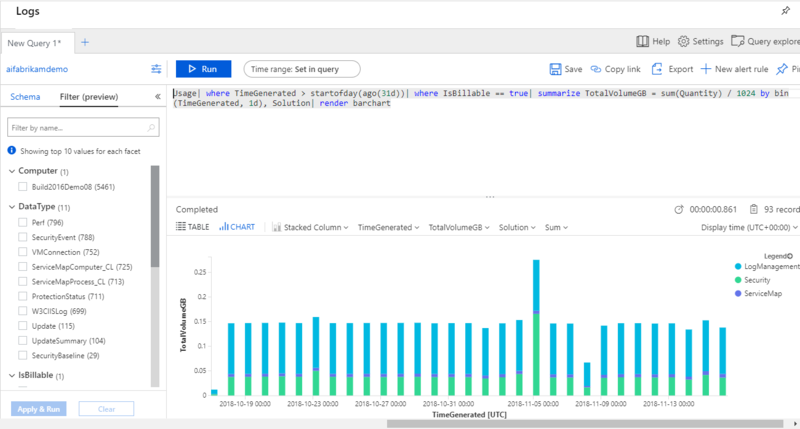 Log Analytics in Azure Monitor is designed to scale and support collecting, indexing, and storing massive amounts of data per day from any source in your enterprise or deployed in Azure. While this may be a primary driver for your organization, cost-efficiency is ultimately the underlying driver. To that end, its important to understand that the cost of a Log Analytics workspace isn't just based on the volume of data collected, it is also dependent on the plan selected, and how long you chose to store data generated from your connected sources. In this article we review how you can proactively monitor data volume and storage growth, and define limits to control those associated costs. Log Analytics makes it easy to understand what the costs are likely be based on recent usage patterns. To do this, use Log Analytics Usage and Estimated Costs to review and analyze data usage. The shows how much data is collected by each solution, how much data is being retained and an estimate of your costs based on the amount of data ingested and any additional retention beyond the included amount. To explore your data in more detail, click on the icon at the top right of either of the charts on the Usage and Estimated Costs page. Now you can work with this query to explore more details of your usage. From the Usage and Estimated Costs page you can review your data volume for the month. This includes all the data received and retained in your Log Analytics workspace. Click Usage details from the top of the page to view the usage dashboard with information on data volume trends by source, computers and offering. To view and set a daily cap or to modify the retention period, click Data volume management. 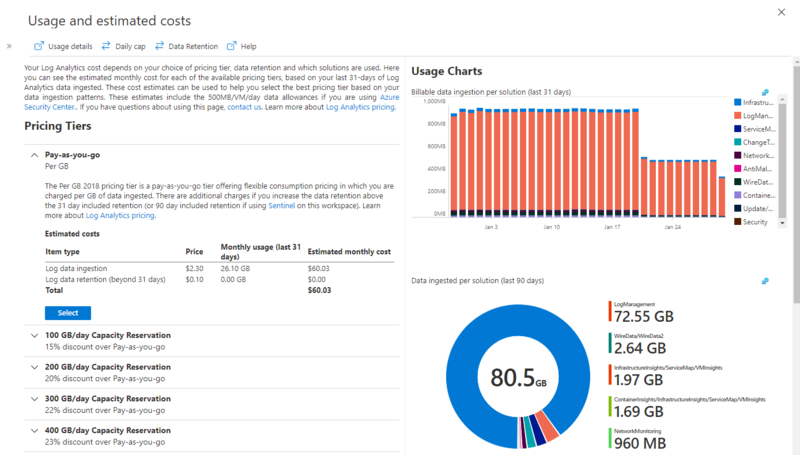 Log Analytics charges are added to your Azure bill. You can see details of your Azure bill under the Billing section of the Azure portal or in the Azure Billing Portal. You can configure a daily cap and limit the daily ingestion for your workspace, but use care as your goal should not be to hit the daily limit. Otherwise, you lose data for the remainder of the day, which can impact other Azure services and solutions whose functionality may depend on up-to-date data being available in the workspace. As a result, your ability to observe and receive alerts when the health conditions of resources supporting IT services are impacted. The daily cap is intended to be used as a way to manage the unexpected increase in data volume from your managed resources and stay within your limit, or when you want to simply limit unplanned charges for your workspace. When the daily limit is reached, the collection of billable data types stops for the rest of the day. A warning banner appears across the top of the page for the selected Log Analytics workspace and an operation event is sent to the Operation table under LogManagement category. Data collection resumes after the reset time defined under Daily limit will be set at. We recommend defining an alert rule based on this operation event, configured to notify when the daily data limit has been reached. Review Log Analytics Usage and estimated costs to understand the data ingestion trend and what is the daily volume cap to define. It should be considered with care, since you won’t be able to monitor your resources after the limit is reached. The following steps describe how to configure a limit to manage the volume of data that Log Analytics will ingest per day. From your workspace, select Usage and estimated costs from the left pane. On the Usage and estimated costs page for the selected workspace, click Data volume management from the top of the page. Daily cap is OFF by default – click ON to enable it, and then set the data volume limit in GB/day. While we present a visual cue in the Azure portal when your data limit threshold is met, this behavior doesn't necessarily align to how you manage operational issues requiring immediate attention. To receive an alert notification, you can create a new alert rule in Azure Monitor. To learn more, see how to create, view and manage alerts. Once alert is defined and the limit is reached, an alert is triggered and performs the response defined in the Action Group. It can notify your team via email and text messages, or automate actions using webhooks, Automation runbooks or integrating with an external ITSM solution. The following steps describe how to configure how long log data is kept by in your workspace. On the Usage and estimated costs page, click Data volume management from the top of the page. On the pane, move the slider to increase or decrease the number of days and then click OK. If you are on the free tier, you will not be able to modify the data retention period and you need to upgrade to the paid tier in order to control this setting. Customers with an Enterprise Agreement signed prior to July 1, 2018 or who already created a Log Analytics workspace in a subscription, you still have access to the Free plan. If your subscription is not tied to an existing EA enrollment, the Free tier is not available when you create a workspace in a new subscription after April 2, 2018. Data is limited to 7 days retention for the Free tier. For the legacy Standalone or Per Node tiers, as well as the current 2018 single pricing tier , data collected is available for the last 31 days. The Free tier has 500 MB daily ingestion limit, and if you find that you consistently exceed the amounts allowed volume, you can change your workspace to another plan to collect data beyond this limit. To use the entitlements that come from purchasing OMS E1 Suite, OMS E2 Suite or OMS Add-On for System Center, choose the Log Analytics Per Node pricing tier. In the Azure portal, from the Log Analytics subscriptions pane, select a workspace. From the workspace pane, under General, select Pricing tier. Under Pricing tier, select a pricing tier and then click Select. If you want to move your workspace into the current pricing tier, you need to change your subscription's monitoring pricing model in Azure Monitor which will change the pricing tier of all workspaces in that subscription. You can learn more about setting the pricing tier via ARM and how to ensure that your ARM deployment will succeed regardless of whether the subscription is in the legacy or new pricing model. Daily limit of legacy Free pricing tier reached Wait until the following day for collection to automatically restart, or change to a paid pricing tier. Daily cap of your workspace was reached Wait for collection to automatically restart, or increase the daily data volume limit described in manage the maximum daily data volume. The daily cap reset time is shows on the Data volume management page. To be notified when data collection stops, use the steps described in Create daily data cap alert to be notified when data collection stops and follow the steps Use the steps described in add actions to alert rules configure an e-mail, webhook, or runbook action for the alert rule. Use these union withsource = tt * queries sparingly as scans across data types are expensive to execute. This query replaces the old way of querying per-computer information with the Usage data type. Note that the clause "where IsBillable = true" filters out data types from certain solutions for which there is no ingestion charge. | where Computer == "computer name"
| parse tolower(_ResourceId) with "/subscriptions/" subscriptionId "/resourcegroups/"
Changing subscriptionId to resourceGroup will show the billable ingested data volume by Azure resouurce group. Some of the fields of the Usage data type, while still in the schema, have been deprecated and will their values are no longer populated. These are Computer as well as fields related to ingestion (TotalBatches, BatchesWithinSla, BatchesOutsideSla, BatchesCapped and AverageProcessingTimeMs. Solution data from computers that don't need the solution Use solution targeting to collect data from only required groups of computers. If you are on "Per node (OMS)" pricing tier, then you are charged based on the number of nodes and solutions you use, the number of Insights and Analytics nodes for which you are being billed will be shown in table on the Usage and Estimated Cost page. | where SCAgentChannel == "Direct"
Data volume exceeds a specified amount. Data volume is predicted to exceed a specified amount. Azure Alerts support log alerts that use search queries. To alert on a different data volume, change the 100 in the queries to the number of GB you want to alert on. Use the steps described in create a new log alert to be notified when data collection is higher than expected. Define alert condition specify your Log Analytics workspace as the resource target. Time period of 1440 minutes and Alert frequency to every 60 minutes since the usage data only updates once per hour. Specify an existing or create a new Action Group so that when the log alert matches criteria, you are notified. Time period of 180 minutes and Alert frequency to every 60 minutes since the usage data only updates once per hour. When you receive an alert, use the steps in the following section to troubleshoot why usage is higher than expected. See Log searches in Log Analytics to learn how to use the search language. You can use search queries to perform additional analysis on the usage data. Use the steps described in create a new log alert to be notified when a search criteria is met. Use solution targeting to collect data from only required groups of computers. To configure an effective event collection policy, review Azure Security Center filtering policy. To modify your event collection settings, review event log configuration. To modify your syslog collection settings, review syslog configuration.